Since the news has been sparse or downright wrong about what is going on with APEC and the Occupy movement, I want you to know what is really going on in the community. Last night The Interfaith Alliance of Hawai`i (TIAH) and Faith Action for Community Equity (FACE) held a beautiful service at St. Augustine’s Church in Waikiki. It was a virtual potpourri of faiths: Protestant Christian, Catholic, Jewish, Muslim, Episcopal, Evangelical, Methodist, Eastern Orthodox, Presbyterian, Disciples of Christ, Lutheran, United Church of Christ, Unitarian Universalist, and Roman Catholic. Each faith had a clergy member who spoke about social justice, the potential impacts of APEC on Hawai`i informed by the experience of other places APEC policies have impacted, and the importance of the Occupy movement. After all the spin from the government about APEC being good for us, it was so refreshing to hear honest assessments about its impact on people (who are NOT part of the APEC picture). It was indeed heartening to hear the churches speak about social justice. 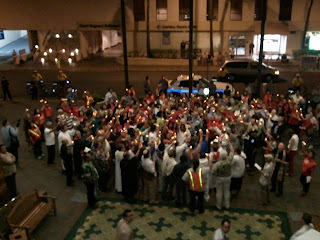 The clergy members spoke about the shame of sweeping the houseless (my partner has Mayor Carlisle on tape saying that they don’t do sweeps), the shame of corporations running roughshod over people the world over and particularly the hotel industry in Waikiki (which used to be owned by hoteliers and are now the speculative investments of banksters), and the government relegating the needs of the people AFTER taking care of their corporate donors. One clergy member said instead of focusing on Paris Hilton, we should be focusing on the housekeeping staff that clean the Hilton! 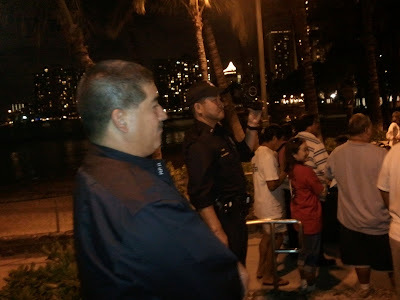 After the service, there was a candlelight procession to the beach in Waikiki where there was a short service to remind folks about where we are and the importance of caring for and about each other, the `aina (land), the wai (water) and the kai (sea). The image was the coconut which is a hearty plant on land as well as the many coconuts floating in the ocean finding land in which to plant themselves. We all took of a piece of coconut dipped in the coconut water to symbolize our unity with each other and our precious resources. This is where I really got freaked out. There were plenty of police and, in particular, a uniformed policeman videotaping the gathering (shades of J. Edgar Hoover). He was uncommunicative, unsmiling and acted like we were all criminals. I asked the policeman next to him why they were videotaping a faith demonstration. I was told that they were just taping a peaceful demonstration. If I was born yesterday, I might have believed that. It made/makes me very sad that we have devolved into this state, where our police end up being the protectors of the corporateers…on our dime no less! Then the procession moved to the Hyatt Regency where we (my estimate is that there were close to 200 people) called upon the Hyatt management to come to speak with the faith leaders. They refused. There was singing and speechifying, all the while under the surveillance of HPD. This is the culture of fear that is being thrust upon peaceful Hawai`I so that these visiting “economies” can feel safe. A culture of fear cloaked in security. Very scary indeed. FREE TRADE, FAIR TRADE, OR JUST OUTSOURCING JOBS? Hyatt is outsourcing jobs to India and the Trans Pacific Partnership (TPP) that Obama and the government are touting is really scary because it calls for the loss of even more jobs. Kelsey says completion of the TPP agreement could potentially impose constraints on regulatory freedoms over non-commodity sectors like public health, consumer rights, state-owned public services, finances and agriculture. WHAT’S HAPPENING IN THE OCCUPY HONOLULU MOVEMENT? The news has been pathetic and often inaccurate about this incredible movement of our youth, mostly students, who have been brave enough to speak out. Eight people who were peacefully demonstrating and exercising their first amendment rights were arrested at Thomas Square on Monday night. Some reports said that they were people from somewhere else. Well, if being a student at UH is the definition of somewhere else, then I guess it’s correct. Another report said they were released without bail. This is a downright lie. They all have receipts! My partner (Henry) and I feel a responsibility to protect their right to express themselves (as they are doing for the 99% of us), so we have been going to the various sites – Thomas Square on the sidewalk on the Beretania St. side and last night at the Gandhi statue by the Zoo. Henry has an APEC press pass, so he has been filming and I go to witness. This has helped diffuse some unpleasant situations as we (Aunty and Uncle) interact with the police and act as a buffer. All the demonstrations have been extremely peaceful, despite some nasty attitudes by uniformed police (who are part of the 99%). APEC, TPP, the Occupy movement are all justice issues. If we fail to speak and fail to protect those brave enough to speak, we will all suffer. Capitalism is breathing its last gasp and these trade deals are part of propping up a failing system. We cannot continue on this path of over-consumption, ‘it’s all about me’, and bailing out banksters who are morally bankrupt while bankrupting the people. There are two links that I am sending you and hope that you view/read. This video was done by the woman who did The Story of Stuff about over-consumption. This one talks about why the government says we’re broke… and how they’re using our money. I hope this riles you up to join the movement and have your voice heard. The second is a 60 Minutes interview with Jack Abramoff, the immoral lobbyist. I urge you to watch the video and/or read the story. This pig was sentenced to 4 years in prison for his multi-million dollar fraud, while we have people serving 5-10-15 years for crimes that are far less egregious. Watch this and get your blood boiling. This is one reason that I get insulted if people call me a lobbyist. I advocate and don’t make any money from my advocacy. My work at Community Alliance on Prisons (CAP) is all volunteer because I want our community to be a just and peaceful place. It takes a major commitment to change things and I am committed to improve the quality of justice in Hawai`i until my last dying breath. People like Abramoff and his croneys are the ones who should be imprisoned. These guys are repeat offenders and the sentence is 4 years. Is that justice? I think not! OK, I’m off my soapbox. I hope you can join us for the JUSTICE FOR KOLLIN ELDERT (our community member murdered by a state department special agent here for APEC) march today that starts from Stadium Park on Isenberg St. We assemble at 3:45 pm for a march to the Convention Center.